Once again, a reported middleweight clash between perennial contender Yoel Romero and rising challenger Paulo Costa has fallen out. Both behemoths at 185lbs were scheduled to meet at the recent UFC 230 event in Madison Square Garden, with Cuban wrestler Romero opting to recover from multiple injuries sustained against Robert Whittaker, leaving the undefeated Belo Horizonte native without a dance partner in New York. The promotion were believed to have eyed an eventual clash between the pair at their premier ESPN+ 1 event on the 19th of January in the new year, but Paulo Costa has picked up an injury, ruling him out of the expected headlining slot. Romero sustained a nasty broken orbital bone in his rematch with current middleweight best Robert Whittaker in the second round of their back and forth clash. After yet another botched weight cut to 185lbs, the now 41 year-old former Olympian was widely expected to make the leap to a more comfortable home of 205lbs, with a clash alongside Alexander Gustafsson momentarily suggested for an Interim crown at UFC 230 failing to materialize. Romero has seen weight issues prevent him from clinching a UFC title on multiple occasions, namely his UFC 221 Interim middleweight title knockout win over Luke Rockhold and his UFC 224 split decision loss to Whittaker in which many had the Pinar del Rio favourite narrowly edging out the Aussie. In both match ups, #1 ranked Yoel failed to make weight successfully. Fast approaching the top five of 185lbs, Paulo Costa has so far displayed unparalleled striking power at middleweight maybe only matched by Romero himself in his first four walks to the Octagon. The Brazilian made hard work of the hot and cold Uriah Hall in his most recent fight, eventually finishing the flashy kickboxer in the second round, earning him the #8 rank in the murderers row that is 185lbs. In a somewhat bizarre ply to earn a fourth tilt at championship honours, the explosive Romero has issued a challenge to the iconic former division king Anderson Silva who recently served a reduced suspension after a USADA test returned positive for hydrochlorothiazide and methyltestosterone, later discovered to be present in a contaminated substance consumed by the Curitiba counter striker. This subsequently allowed him to return to active competition in November 2018. ‘The Spider’ last competed at the controversial UFC 208 in Brooklyn, scoring a unanimous decision win over Derek Brunson. Silva, who will turn 44 next April, has recently dropped losses to Daniel Cormier on short notice and a razor thin decision defeat to Michael Bisping, which ultimately earned the British striker his successful siege of the middleweight crown against Luke Rockhold. UFC Fight Night 143 takes place at the Barclays Centre in Brooklyn, New York on January 19th, and currently features a welterweight match up between Belal Muhammed and Geoff Neal, and a Women’s flyweigth clash between prospects Paige VanZant and Rachael Ostovich-Berdon. With UFC 229 only days away, former two weight champion Conor McGregor has been doing the necessary media rounds to promote his 155lb title fight with Khabib Nurmagomedov. As is tradition, the Irishman has not been shy when it comes to making outlandish statements during these interviews. One of his more surprising comments came during an interview on the Ariel Helwani MMA Show on Monday. While taking Ariel throihh a list of potential future opponents whixh included the likes of Georges St Pierre, Nate Diaz and Tyron Woodley, the Notorious one through a rather unexpected name into the mix. The UFC never fails to bring a wow moment. A champion taking a shock defeat, or a heavy favourite losing out on their number one contender fight, we get to see it all. In this article, we’re going to give you our list of the top five upsets from recent years inside the UFC. We hope you enjoy reading. Renan Barao was a dominant champion if ever there was one. On a 32 fight win streak and the UFC bantamweight champion for four years beating everyone in his way. He beat names like Uriah Faber, Michal Mcdonald and Brad Pickett in his time of total dominance before coming up against TJ Dillashaw. Dillashaw had impressed in previous fights, but nobody expected him to dethrone the Brazilian champion in the fashion that he did. Dillashaw had lost to John Dodson and Raphael Assuncao in previous fights but beat Mike Easton in a fairly unimpressive fight by decision before getting his shot at the 135-pound strap. At UFC 173, Renan Barao was scheduled to fight Raphael Assuncao, but Assuncao had a rib injury from his previous fight which hadn’t healed properly. This left the door open for Dillashaw to fill in at short notice and he jumped at the opportunity. Dillashaw looked like the champion in that fight, he completely dominated and Barao was outclassed in every aspect of the fight. Dillashaw was first with every punch and kick and Barao had no answers for the questions being asked of him from the American. In the fifth round Barao couldn’t withstand any more punishment, Dillashaw landed a head kick which would have toppled over an elephant before landing some finishing punches to end the fight. Barao’s unbeaten streak was over and it was TJ Dillashaw who would now carry the torch for the UFC’s 135lb division. Despite being plagued with injuries, Dominick Cruz was dominant in the bantamweight division for nine years. He never lost his title but was forced to hand in his beloved champion status due to not defending his belt. Although, he won it back the first time of asking, despite fighting only once in a five year spell away from the sport. Cruz has beaten some of the best fighters MMA has to offer over the years, with names like Demetrius Johnson, Uriah Hall and the before mentioned TJ Dillashaw, all falling victim to “The Dominator”. Cody “No Love” Garbrandt was up and coming and was fierce. He clearly had no fear of Cruz and felt he was the man to end Cruz’s reign at the top of the bantamweight division. “No Love” was knocking out everyone in his path with his explosive fists. He possesses such punching power he would illuminate the octagon when he caught his opponent with a deadly hook or uppercut. But Cruz was confident in his footwork and imagined he would be able to evade the devastating strikes from Garbrandt, but boy was he wrong! “No Love” finally got his shot at UFC 207 after enduring a 10 fight win streak. Early on in the fight, it was clear that Garbrandt was much faster than Cruz had imagined. Garbrandt was able to close the distance, strike Cruz, and return to a safe distance before Cruz could land a counter strike. This was infuriating for “The Dominator” as this is what he had done to opponents for so many years. Garbrandt was literally dancing and mocking Cruz, then landing more strikes and returned to mocking. “No Love” won the fight with a convincing decision victory, leaving the UFC bantamweight division shocked and impressed. Garbrandt is the real deal and nobody will ever underestimate him again. Anderson Silva holds the longest-serving middleweight champion title of all time inside the UFC. He held the belt for over seven years and was on a 16 fight win streak, defending his middleweight crown 10 times. Many wondered if Silva was apart of the matrix by the way he dodged and ducked his opponent’s strikes and landed his own strikes with such ease and fluidity. Many think Silva is the greatest fighter of all time and he has earned that accolade with victories over Chael Sonnen, Vitor Belfort, Dan Henderson and Forest Griffin, just to name a few. Nobody expected the king of the middleweight division to be dethroned quite the way he did. Chris Weidman, however, was hungry. He had procured a 9-0 pro record and was looking great in his fights. “The All-American” had shown he had knockout power of his own, but he also had a great ground game and a wrestling ability to match. Weidman also looked fearless in his fights and was ready to face the Brazilian. Make no mistake about it, the king was not going to be receiving any respect from the hungry American. At UFC 162 we all expected another highlight reel finish from Silva to add to his growing collection. We all knew Weidman had great potential, but we didn’t expect what was soon to follow. “The All-American” started off strong, however, neither fighter was in complete control of the fight. But, in the second round, Silva was ducking and swaying Weidman‘s punches, until Weidman caught the Brazilian right on the chin. As Silva dropped like he’d just been dealt a swift kick in the crown jewels, Weidman pounced, and Silva’s inability to recover forced the referee to call an end to the action and the middleweight division had a new champion in Chris Weidman. Ronda Rousey was the reason female MMA took off so well in the UFC. Her Olympic judo and exceptional arm-bars became a thing of beauty and a regular occurrence during her time at the top of the woman’s UFC bantamweight division. Rousey had an undefeated record of 12-0 and was easily dismantling every challenge the UFC put in front of her. She was relishing her time at the forefront of women’s MMA. Holly Holm had only been on the MMA circuit a short while, however, she had an extensive record in both boxing and kickboxing and had collected multiple accolades in her time in both sports. She had also gained a 9-0 pro-MMA record in four short years and had earned her toughest fight yet, a shot at Ronda Rousey, The Pioneer of women’s MMA period. Many didn’t know what to expect from this fight. It was the most intriguing fight MMA fans and experts were most excited for. Rousey had made no reason to ever doubt her abilities by being so dominant, but Holm had tools which Rousey had never had to deal with prior to her fight with “The Preachers Daughter”. But it was at UFC 193 Holly Holm shocked the world. Rousey marched to the octagon with her war face on, ready to demolish another victim, while an anxious Holm awaited her fate. But after Bruce Buffer announced the two ladies and the referee let them know what was expected of them, the fight commenced. Rousey flew at Holm trying to close the distance early on, but Holm was able to keep the distance and land her shots on the champion. Rousey grew more and more frustrated as “The Preachers Daughter” was able to dodge and duck all the champions efforts and kept on landing her own shots. Holm was making a mockery of Rousey and there was nothing she could do about it. 57 seconds into the second round, Holm landed her famous Cro–Cop styled head kick, and the champion dropped. Holm had done it! The UFC’s greatest female champion had been defeated, and Holm was the new queen of the women’s bantamweight division. Luke Rockhold was enjoying life in the UFC. Prior to signing with the UFC, he was the Strikeforce middleweight champion and showed the wide range of skills that he possessed. Legit knockout power in his hands, ferocious kicks, and a Brazilian Jiu-Jitsu game even Royce Gracie would approve of. Despite losing to a roided up Vitor Belfort in his first fight for the UFC, Rockhold went on a five-fight win streak to win the UFC middleweight title, defeating Michael Bisping, Lyoto Machida and the champion Chris Weidman all in fairly straightforward fashion. Many thought we may see another middleweight champion as dominant as Anderson Silva if previous fights were anything to go by. Michael Bisping, however, was waiting to fulfill his destiny, and since losing to Rockhold had gone on a three-fight win streak defeating CB Dollaway, Thales Leites, and Anderson Silva. The 10-year UFC veteran knew his time was running out to ever become the UFC champion he had forever wished he’d one day become. But at UFC 199, Rockhold was scheduled to fight Chris Weidman in a rematch, but an injury forced “The All-American” off the card. On just 10 days notice, Bisping got the call he had always dreamed of, a title shot. “The Count” was pursuing his acting career and was in the middle of shooting a film, but turning down the fight wasn’t an option. He accepted immediately and got a flight straight home to begin the growling weight cut to 185lbs. Rockhold looked arrogant as always and seemed to think he was too good and couldn’t be touched. After the last time these two collided, Rockhold felt that Bisping had nothing in his arsenal that could trouble him and it was only a matter of time that an opportunity would present itself and he’d be able to finish Bisping again. But he couldn’t have been more wrong. After throwing a straight punch at Bisping, the Englishman was able to move to the left of Rockhold and land a left hook over his opponent’s shoulder. Rockhold dropped like a led balloon. Every fan watching in the UK was leaping out of their seats as Rockhold scrambled back to his feet, but Bisping landed another left hook which dropped Rockhold again. Bisping then landed a three punch combination to the face of the stunned American and the ref jumped in to save him. Bisping had done it! 10 years of blood, sweat, and tears were worth it as Bisping roared when Bruce Buffer announced: “AND NEW”. What an amazing sports MMA really is. We look forward to many more of these moments in the future. On July 1st 2015, the UFC introduced their new Anti-Doping program in partnership with the United States Anti Doping Agency (USADA). Coincidentally, this date marked a turning point in the career of a number of previously prolific fighters. It isn’t for me to speculate on the exact reasons for the dramatic changes in fortune of these four fighters. Age, injury, bad match ups have all played a part in some form or another. That said, it does seem that July 2015 was a real turning point for many UFC fighters careers, particularly the fighters below. Below, I break down the shift in career trajectory of four athletes who prior to July 2015, were some of the UFC’s brightest stars. Erick Silva arrived in the UFC as a highly touted welterweight prospect with a record of 13-1-0 (1 no contest). Making his debut in August 2011, Silva made short work of Luis Ramos, picking up a TKO victory in just 40 seconds. Unfortunately for Silva, he never really lived up to his potential and spent the next four years alternating wins and losses. Things finally seemed to be coming together with a March 2015 win against Josh Koscheck. This was the first time the Brazilian had won two fights consecutively since 2011. Silva returned to action looking for his third win in a row at UFC Fight Night 74 in August 2015, two months after the UFC implemented their new Anti-Doping partnership with USADA. At the weigh ins, Silva presented a much softer physique which drew a significant amount of attention from fans and fighters alike. The search for a third win was ultimately unsuccessful and what followed has been a real disappointment. 5 fights with a lone win, sandwiched in the middle of four losses. The dramatic physique change accompanied a sharp downturn in form, which will always leave unanswered questions hanging over Silva’s time in the UFC. Just last week, this time came to an end with the announcement that the one time hot prospect had been released from the UFC roster. Johny “Bigg Rigg” Hendricks has had a rough time over the last two years. From botched weight cuts to underwhelming performances, Hendricks has been a shadow of the man who defeated Robbie Lawler to claim the UFC welterweight title in 2014. Bigg Rigg’s luck seemed to change in his February 2016 fight with Stephen Thompson, almost a year after his last fight where he defeated Matt Brown in March 2015. The battle with Thompson was the first time Hendricks had been stopped in his 21 fight professional career. Hendricks missed the welterweight limit in his next two fights and added two additional losses to his record. It was also the first time in his career he had lost consecutive fights. After taking the decision to move up to middleweight Hendricks finally snapped his losing streak with a unanimous decision win against Hector Lombard. Just when it seemed his luck was turning, Hendricks missed weight again, coming in 2lbs above the middleweight limit. Rubbing salt into the wound, the 34-year old was on the receiving end of the second TKO stoppage of his career on fight night. In his most recent attempt to reverse his fortune, Hendricks faced fast rising prospect Paulo Costa at UFC 217. Sadly for Hendricks this fight ended in his second consecutive second round TKO loss. One could make the argument that father time has caught up with Hendricks with more than half of his fights going the distance. He’s been involved in some legendary fights over the years and there is every chance that those battles have taken their toll on the former champion. Unfortunately for Hendricks, the timing of his dramatic change in fortune will invariably leave fans speculating over what might have caused his sudden decline. At 40 years old and with a career spanning 21 years, it is inevitable that Vitor Belfort would have to slow down sooner or later. The dramatic changes in both his performance and appearance certainly escalated that decline. Prior to July 2015, Belfort was a force to be reckoned with. His win list reads as a who’s who of the middleweight and light heavyweight divisions. His only losses coming at the hands of certified greats Jon Jones and Anderson Silva in addition to then middleweight champion Chris Weidman. In his first fight of the USADA era, Belfort picked up a first round KO victory against Dan Henderson but followed this up with three consecutive KO defeats. The most recent of these ended up being over turned to a no contest after the victorious Kelvin Gastelum tested positive for THC. The idea that Belfort would be knocked out in three consecutive fights would have seemed unthinkable a few years ago. It is common knowledge that Belfort has received Testosterone Replacement Therapy (TRT) in the past. Fans and analysts often refer to ‘TRT Vitor’ as an example of just how scary an MMA fighter can be. While the rules around TRT are somewhat murky, Belfort never received a suspension for his “medically prescribed” TRT treatment. Looking at the physique of the former champion today compared with how he looked in his prime, it begs the question, just how much of a physical advantage did Belfort receive due to the TRT treatment? Just a few years ago Anderson Silva was almost universally considered to be one of the UFC’s greatest of all time. Many still hold that opinion but events of the last 3-4 years have irreversibly changed the opinion of a large portion of the fan base. It would be unfair to suggest that Silva’s problems began after the introduction of USADA. Things really began to go south for the former great in 2013 with a pair of bouts against fellow middleweight Chris Weidman. Silva entered his first fight with Weidman as middleweight champion. He hadn’t lost a fight in six years. He held the company record for most consecutive title defences. He was a hero. Unfortunately, all of this came crashing down around him just 1 minute into the second round. Silva, with his hands by his hips, taunting Weidman, was caught flush on the chin and dropped to the ground where he was finished by a flurry of punches from the American challenger. Silva no longer seemed invincible. Granted an immediate rematch, Silva met Weidman for the second time in December 2013. This time out, he showed a little more respect to the newly crowned champion but nobody could have predicted what happened 1 minute and 16 seconds into the second round. Silva threw a fairly innocuous inside leg kick which was checked by the champion. In a moment MMA fans will never forget, as the kick connected, Silva’s leg snapped. The former champ fell to the ground unable to continue and he experienced the first consecutive losses of his career. 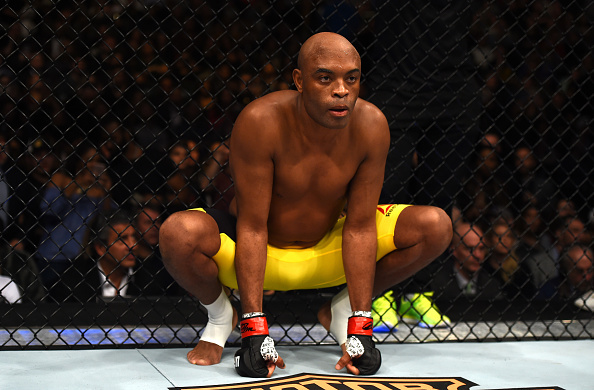 After a long lay off to recover, Silva made his return to the octagon in January 2015 against Nick Diaz. The fight ended with a unanimous decision victory for Silva but this was quickly overturned to a No Contest after it was announced that both fighters failed pre-fight drugs test. Silva had tested positive for an anabolic steroid. It later emerged that Silva had also failed a fight night drugs test for separate substances. In an effort to save his legacy, Silva’s team acted quickly to protest his innocence and find an explanation. That explanation ultimately ended up being that Silva had taken a tainted sexual enhancement pill. The Nevada Athletic Commission rejected the explanation and handed Silva a one year suspension. During the hearing, Commissioner Anthony Mundell cast doubt over Silva’s previously clear test record. The Brazilian legend returned from his suspension to face Michael Bisping in February 2016 with the new USADA regime in place. That fight ended with in a unanimous decision win for Bisping. Silva followed this up with a second unanimous decision loss, this time to light heavyweight champion Daniel Cormier at UFC 200 after stepping in at short notice due to a failed Jon Jones drugs test. Silva picked up his first win in 4 and a half years at UFC 208 against middleweight Dereck Brunson. Maybe things were finally getting back on track for the 42-year old. Sadly not. Before he could get a chance to fight again, Silva was flagged by USADA for another failed drugs test and suspended indefinitely, pending the outcome of an investigation. The former champion continues to protest his innocence but with two instances of failed tests in the last three years, things are not looking good for Silva or his legacy. I’ll leave it with you to draw your own conclusions on what was the biggest cause of the declines each of these fighters has experienced. Of course, the fighters discussed above aren’t the only ones to experience a change in fortune once the UFC entered into partnership with USADA. I should add – before anyone mentions his name, Alistair Overeem is 4-2 since July 2017 with his only losses coming against reigning heavyweight champion Stipe Miocic and title contender Francis Ngannou. Compare that to his pre July 2015 record of 4-3, his form has actually improved since the introduction of USADA. With that in mind I didn’t feel he warranted inclusion in the list above, despite a pretty dramatic physique change over the past few years. Let me know who you think has struggled the most since July 2015 in the comments below.